HomeWho’s fault was it anyway? Who’s fault was it anyway? Overall, this was not a great offseason for the San Francisco 49ers. They are returning half of their starters on opening day a year ago. One of the starters that left was wide receiver Michael Crabtree. He left the Bay Area…wait no he actually stayed in the Bay Area and moved to the other side to join the Oakland Raiders. That is flat out harsh. Telling reporters that he didn’t get the ball enough and that Kap wasn’t motivated is some serious criticism. First, it makes Crabtree sound selfish. Second, how much more did he want the ball thrown his way? Kaepernick targeted Crabtree 108 times last season. That ranked him tied 34th in the league among receivers, which doesn’t seem like very much. Consider as well that Kaepernick also targeted Anquan Boldin 130 times as well, which has to make Crabtree feel like he is an afterthought. However, you have to wonder maybe Kaepernick started to lose some confidence in Crabtree as the season wore on. Crabtree only managed to pick up 10.3 yards per reception last season, including 6.55 yards per catch over the last five games. Meanwhile, Boldin racked up 12.8 yards per catch over the course of the season. 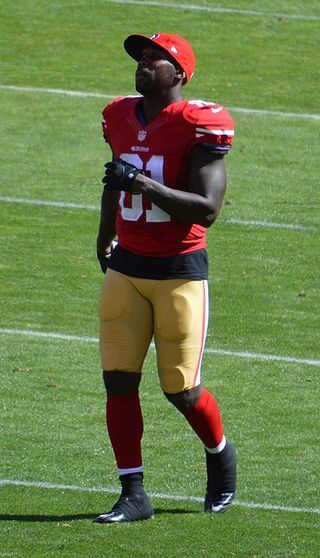 Also, throwing in Boldin’s direction was a much better decision for the 49ers as a team. On 108 targets last year, Crabtree picked up on 698 yards, for an average of 6.46 yards per target. Throwing Boldin’s way was much more productive. Boldin tallied 1062 yards on 130 targets, for an average of 8.17 yards per target. That might not seem like much but even if you were to target both receivers 10 times in one game, the difference would be 17 yards per game. Over the course of a 16-game season, the difference becomes 272 yards per season. It’s no wonder Kaepernick stopped looking his way as the season continued. There were other reasons too. Both Boldin and Crabtree dropped seven balls over the course of 2014. However, their comparative drop rate was 5.3 percent for Boldin and 6.5 percent for Crabtree. Clearly, Boldin showed better hands and was less likely to drop the ball when it was thrown his way. Crabtree is also delusional if he thinks that heading to Oakland will result in an immediate upgrade for him at quarterback. Kaepernick hasn’t been a Hall of Famer but he has definitely played better than Derek Carr. In 2014, Kaepernick had a better completion percentage, more passing yards, a better yards per attempt, fewer interceptions and considerably more rushing yards. Then looking deeper, Kaepernick finished the season with a Total QBR of 60.2, which was the 14th best mark in the league. On the other hand, Carr completed the year with a QBR of 38.2, better than only two other quarterbacks in the league. There is no chance that anyone is picking Derek Carr to lead a team over Colin Kaepernick this season. Maybe two years from now, sure. But right now? No chance. I think Kaepernick has been about as effective as you could expect considering his lack of general surrounding talent. Honestly, based on last season showed us, it should be Kaepernick taking shots at Crabtree for being ineffective. Crabtree has no right complaining about the play of his quarterback until he starts playing like wide receiver he thinks he is. ← What was Greg Hardy thinking?